We are providing an excellent quality of SMT Job Work. We are mounting all type of SMT components with best quality. We provide one of the best in class PCB Assembly service, which includes mounting of SMD components. 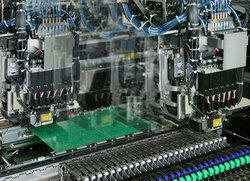 We cater solutions for LED manufacturers and electronic card OEMs. Leveraging on our prosperous industry expertise, we provide SMD Soldering Work. These works are accomplished using the advanced techniques. In addition, our provided work is rendered in diverse terms and forms that meet on client’s demand. In addition, we render this work at nominal rates. We have advanced Japanese technology for assembling of Surface Mount Devices (SMD) to fulfill the needs and quality requirements of our customers. Our setup consists of Juki’s Automatic Pick and Place machine, Stencil printer, conveyor, reflow oven, UPS and ultrasonic PCB cleaning machine. The set-up is completely free from Electro-Static Discharge (ESD). We have specially trained professionals having years of SMT work experience to deliver the best quality jobs with great precision and accuracy. We are mounting all type of SMT components with best quality.